Scott Kelly will spend a year on the International Space Station. Some of his work will involve comparison experiments with his twin brother and former astronaut, Mark Kelly, who will be on Earth. Image uploaded on Aug. 12, 2013. As Scott Kelly flies in space on a year-long mission aboard the International Space Station, his twin brother Mark will remain on Earth and act as a sort of experimental control. The investigations will compare any genetic changes that take place while Scott is in space and Mark, who retired from the astronaut corps in 2011, carries out his daily life in Arizona. "These pilot demonstration projects, the first of their kind, will be unique investigations into the genetic aspects of spaceflight," NASA officials explained in a statement on Aug. 8. "They will provide insight into future genetic investigations that can build on this study, but with a larger study population of unrelated astronauts." The Kelly brothers are the world's only identical twin astronauts and were both Navy test pilots before joining NASA, were both selected as astronauts in 1996. Between the two of them, they've flown seven space missions to date. Astronaut brothers Scott Kelly (left) and Mark Kelly. 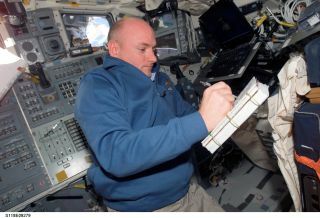 Scott Kelly will spend a year on the International Space Station starting in 2015. Mark flew four space shuttle missions, including commanding the penultimate space shuttle flight (STS-134) just months after a failed assassination attempt on his wife, then-Arizona congresswoman Gabrielle Giffords, in 2011. Scott flew three missions, including commanding Expedition 26 during a 159-day stay aboard the International Space Station in 2010 and 2011. His next mission is an unprecedented one-year mission aboard the station, along with Russian cosmonaut Mikhail Kornienko. Only a handful of humans have stayed in space for a year or longer, all of them Russians aboard the space station Mir. (A typical International Space Station mission is about six months long.) NASA has said the longer mission will be an opportunity to more fully investigate how weightlessness affects the human body. Because Mark will not be living in a controlled environment, NASA said the genetic studies will be "observational in nature." "There are no defined outcomes for the investigations; instead, this is a chance to compare data collected from genetically similar astronauts to observe the human effects of spaceflight," officials said. While the exact procedures are still being worked out, NASA officials said that the tentative plan is to take blood samples from the brothers before, during and after the year-long mission. NASA is also considering "limited" experiments using saliva, cheek swabs or stool samples as long as they don't interfere with other work on the space station. The agency aims to better understand the "physical, physiological and environmental stressors associated with human spaceflight," which could involve investigations such as how the space environment changes DNA. NASA officials — who said the agency's newest astronaut class will train for deep-space missions — added that the investigations will help with learning more about long-duration spaceflight. "These investigations could have lasting implications for protecting astronauts on deep space exploration missions, including travel to asteroids and Mars," NASA officials said..
Research proposals are due Sept. 17. Selected investigations will be announced in January.